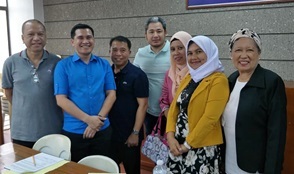 What could have been a chilling experience to certify schools in Benguet was replaced by a short exciting trip to the south of the Philippines. Dr. Galve was scheduled by PEAC - FAPE to certify private schools in Zamboanga City and Sarangani. Together with him were Mr. Jed Rivera from Cebu and Mr. Rocky Acluba from PEAC Central Office. The first school for certification was a small school from Duhol-duhol, Siasi, Sulu. PEAC requested that the school be certified in Ateneo de Zamboanga as the security is uncertain and the transportation is scarce. All school documents and several school personnel were transported to Zamboanga City. Pictures and video footages were part of the transported package to the Peninsula. Since there was no classroom observation, Mr. Rocky Acluba set-up an on-the-spot interview with students through a phone patch. On January 25, 2019, the team flew from Zamboanga to Davao and boarded a bus for Gen. Santos City. The three hours land cruise provided certifiers an opportunity to enjoy the beauty of the province. 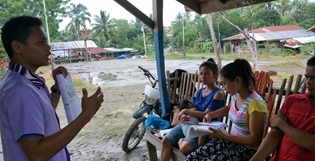 The next school for certification was a memorial learning center that offers Open High School program in Malungon, province of Sarangani, hence, classes are held on a Saturday. Teachers are transported to Bangayan, a 45-minute travel by a motorcycle from the main campus. Because of the absence of classrooms, teachers held their classes in a small waiting shed. The travel was difficult as the road is too steep and slippery brought by drizzles. The certifiers were able to convene at their headquarters in the main campus by almost 12 noon. Early in the afternoon, the team headed back to Gen. Santos as Dr. Leo Galve and Mr. Rocky Acloba had to catch their flight back to Manila. Certifiers saw the eagerness of young people to learn despite the absence of classrooms. On the other hand, teachers brave the terrain in all weather conditions well-prepared to teach. May the Lord continue to bless them with enough strength and wisdom in sustaining their dedication to excellent education!